University of Sydney archaeologists are uncovering the remains of a building used by travelling Persian royalty in the 5th century BC. Situated in a fertile valley about 125 kms west of Shiraz, the building served royal travellers on the famous Royal Road - the route linking the capital Persepolis with Persia's westernmost provincial capital Sardis, in Lydia*, according to the University of Sydney's Professor Dan Potts. "The so-called Royal Road was the main artery linking Lydia with Persepolis, and yet apart from a description by the contemporary Greek historian Herodotus, we know virtually nothing about it" said Professor Potts from the excavation site in Iran. "For all the fame of the Persian empire and its founder Cyrus, and for all of its enormous territorial extent, from Turkey, Egypt and the eastern Mediterranean in the east, to the Hindu Kush in the west, extraordinarily little archaeological research has been done in Iran itself." The site, called Jinjun, was first noted in western literature by the German scholar Ernst Herzfeld in 1924. "It was briefly investigated in 1959 by a Japanese expedition, but has lain dormant ever since," said Professor Potts. "Now for the first time we have excavations at this site, which was a stopping point on the Royal Road - not for messengers, bureaucrats, or other travellers, but rather for the royals themselves, since the building we're excavating is no ordinary road house. "It is set back from the main road, across a river and at the base of a mountain for security. The building looks out north towards the road and the river beyond. It offered an ideal, well-watered, very beautiful location which is about 150kms west of Persepolis, or about seven days journey." The building appears to have measured 50m by 30m, and test excavations have uncovered elaborate column bases comparable to those at the Achaemenid Persian capital Persepolis. The bases probably formed part of a larger portico or entrance. A large area of intact paving made of irregularly shaped stone slabs, immediately to the south of the column bases, probably marks the entrance way to the building's interior. "We have also found several fragments of white and pink highly polished stone vessels, comparable to examples known from Persepolis, as well as pieces of unusually thin, clear glass. All of this suggests elite usage of the sort consistent with the Persian ruling family itself, rather than commoners or even government officials," said Professor Potts. 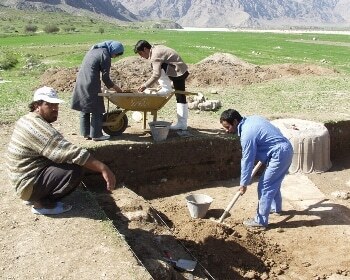 The site is one of about 50 within the research area of a joint Australian-Iranian archaeological expedition led by Professor Potts, along with Edwin Cuthbert Hall, Professor of Middle Eastern Archaeology, and Alireza Askari Chaverdi, of the Iranian Center of Archaeological Research. Other University of Sydney people taking part in the excavation are recent graduates in archaeology Amanda Dusting and Kat McRae, and Edna Wong, a current PhD student supervised by Professor Potts. The excavation is funded by an ARC Discovery grant that involves a five-year agreement for collaborative research between the University of Sydney and the Iranian Center of Archaeological Research. 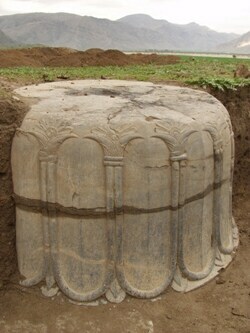 Future excavations are planned to expose the entirety of this unique monument.